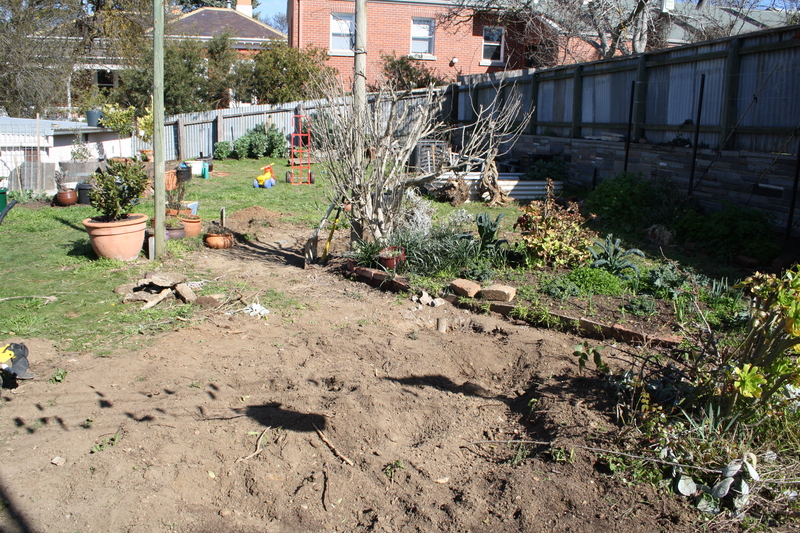 I have a basic plan for the garden now, so Ive been focussing on setting up the main skeleton of the design, by preparing beds for the fruit trees and planting the trees, and setting up temporary vegetable beds (until I figure out what sort of vegie beds I want in the long-run). 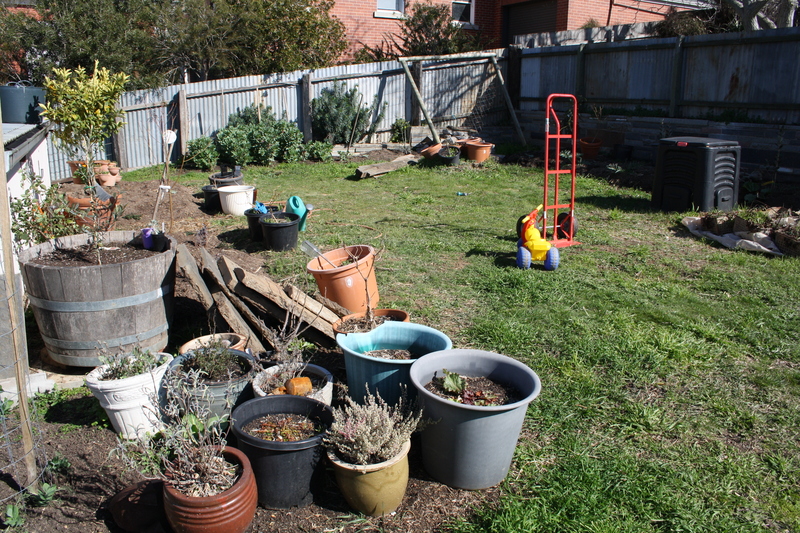 I’m preparing the fruit tree beds by digging out cooch grass, and building up no-dig beds by layering loads and loads of bought compost, cow poo, pea straw and lucerne, and sometimes mushroom compost. 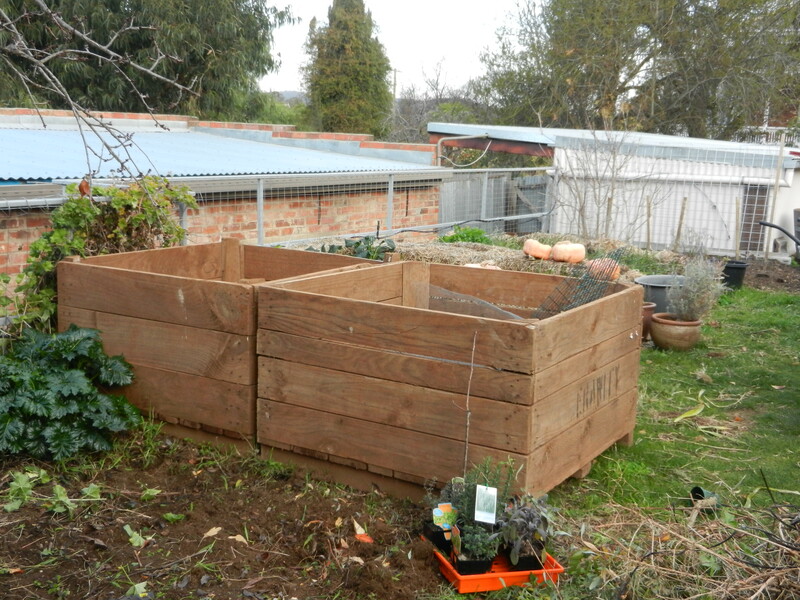 I’d love to use my own compost but I just don’t have enough to get started let alone the metres and metres of garden beds I’m putting in. And our soil is pretty heavy clay so going down is not an option. 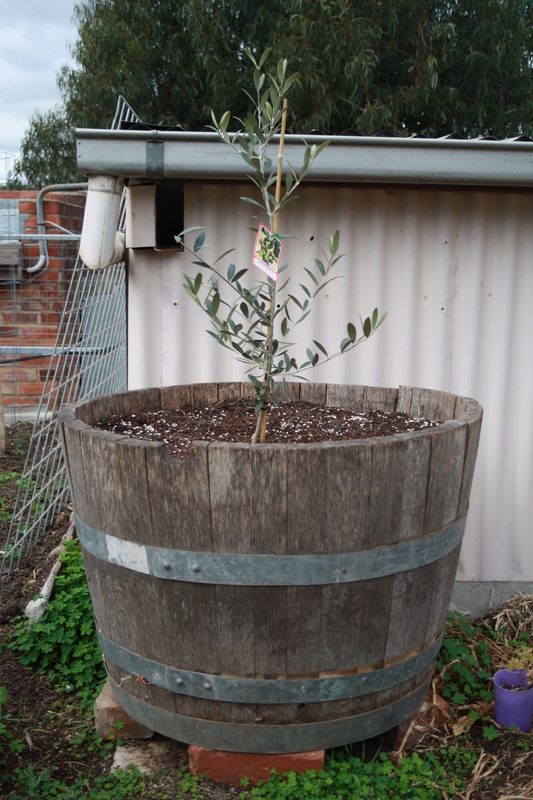 Autumn: plant hardy evergreens (olives – Manzanillo, Kalamata and Verdale; feijoas – Duffy and Apollo; and loquat – Herds Mammoth). Winter: plant deciduous trees, vines, and berries (17 dwarf apples to espalier – see this post on establishing apples trained as cordons; one dwarf stella cherry; two dwarf nectarines – Fantasia and Goldmine; and one dwarf peach – China Flat; three Fragola grape vines which I got from Karen Sutherland’s wonderful garden during an open garden session; and two Jostaberries bought on a whim. Spring: plant dwarf citrus trees (Tahitian lime, Japanese seedless mandarin, and two varieties of navel oranges). 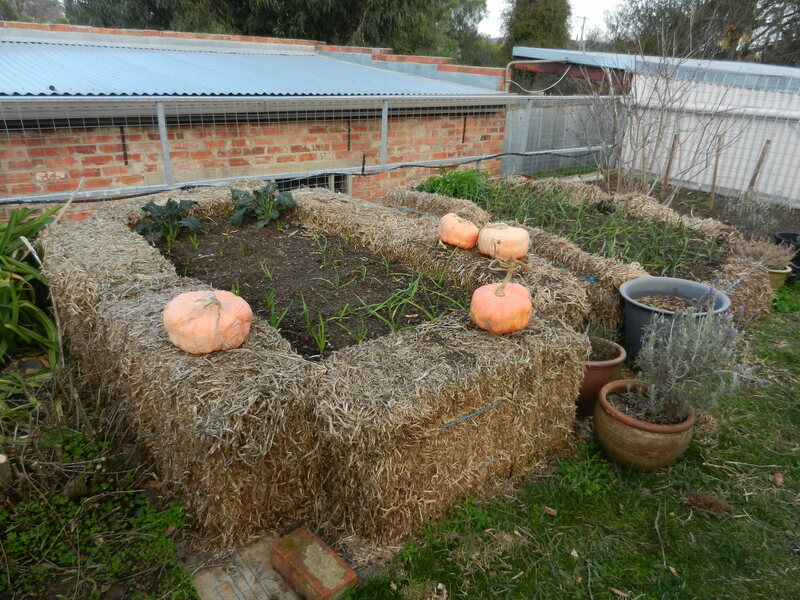 I’ll be babying these for quite a few years over the winters with frost protection structures until they are old enough to withstand the frost without damage. As for other spring evergreens, at this stage I’m planning on a strawberry guava or two. Loquat with feijoas in background. Underplanted with artichoke, rhubarb and goji berries. Manzanillo. 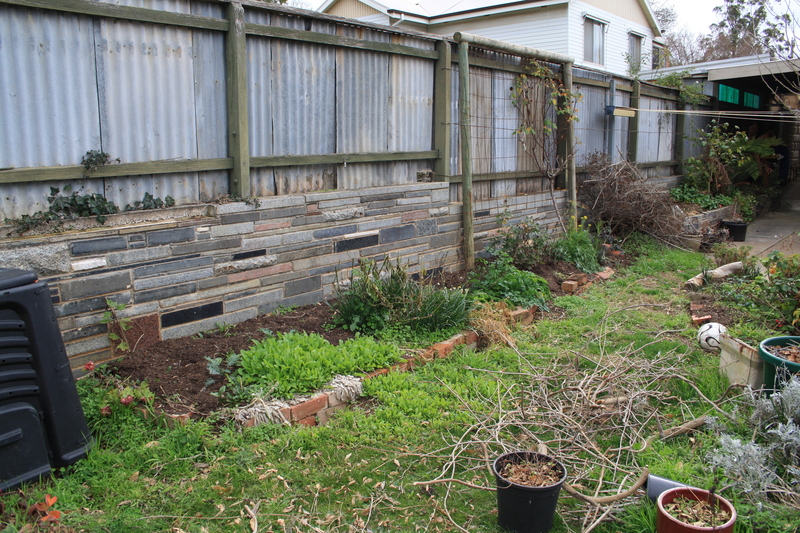 Seven holes drilled in the bottom, raised on bricks. The inside has a layer of mesh spread over drainage holes to prevent soil from clogging the holes, and the soil is a mixture of certified organic potting mix, coco peat (coir), and perlite. Verdale planted in mounded bed. 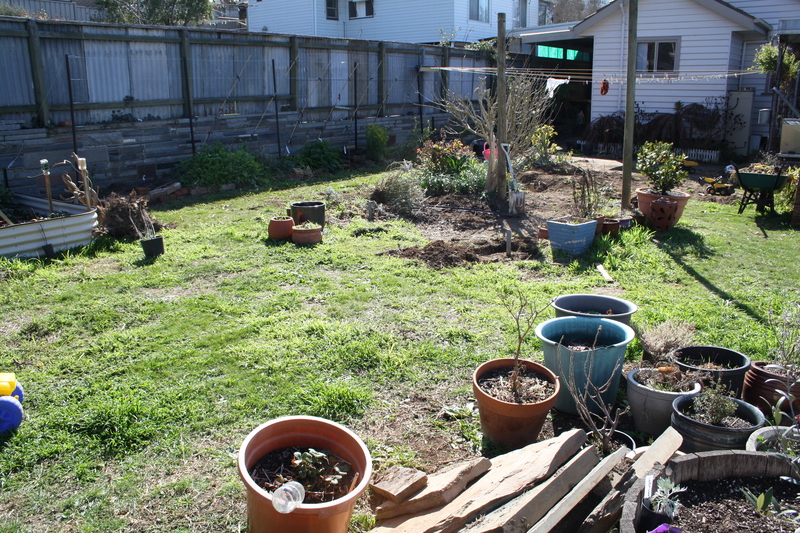 Soil is a mixture of good quality compost, cow manure, and coarse builder’s sand. 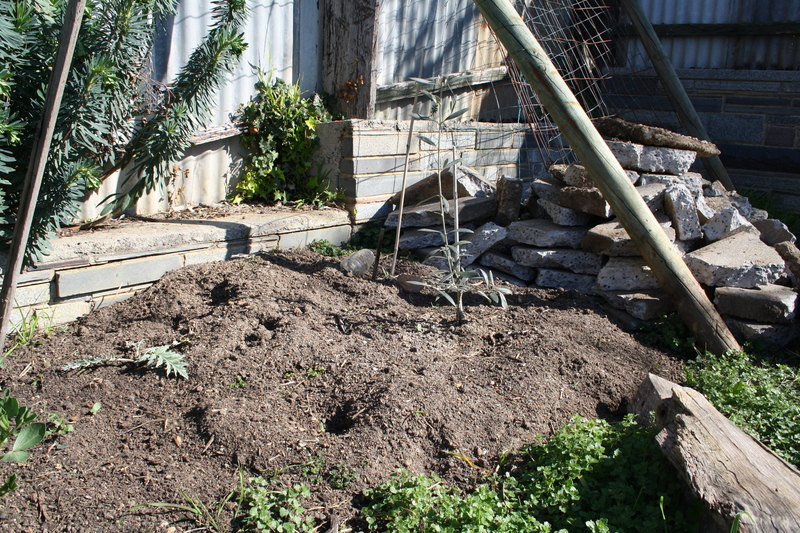 Underplanted with a couple of artichokes. Apples trained to form an oblique cordon. 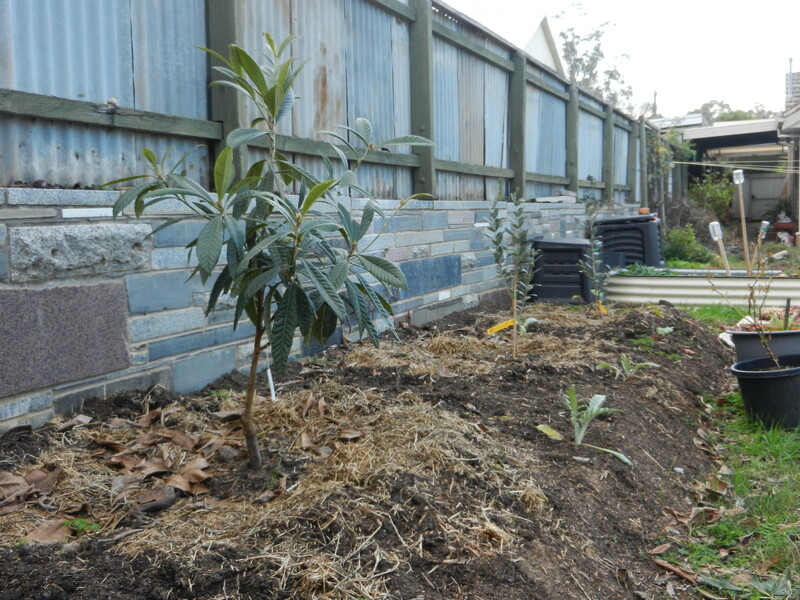 Stone fruit in mounded beds – from front to back: dwarf stella cherry, dwarf China Flat peach, dwarf Fantasia nectarine, dwarf Goldmine nectarine. 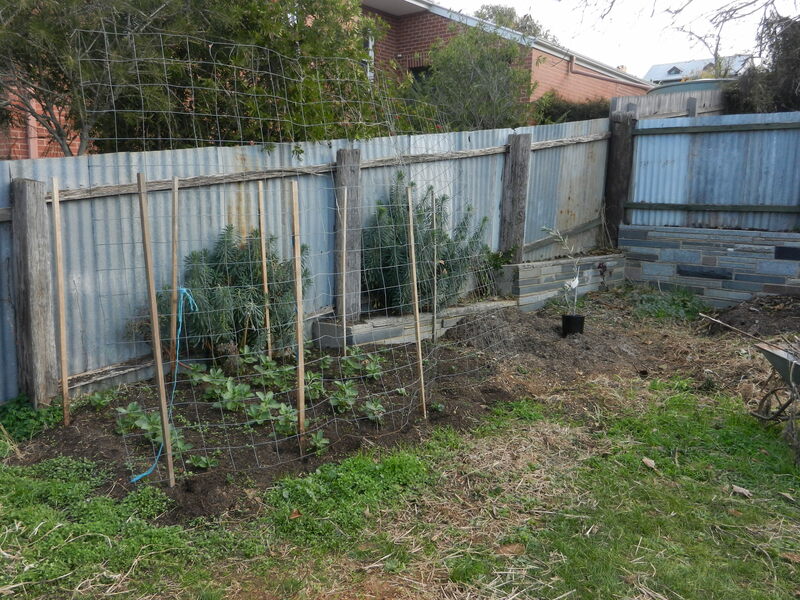 Broadbeans growing in spot where citrus and olive trees are to go. 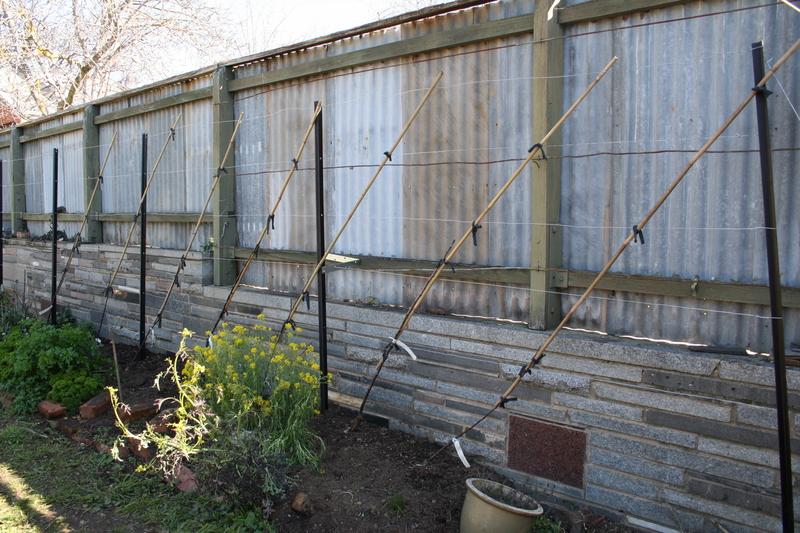 Peas and others growing in spot set aside for citrus once Spring is well underway. 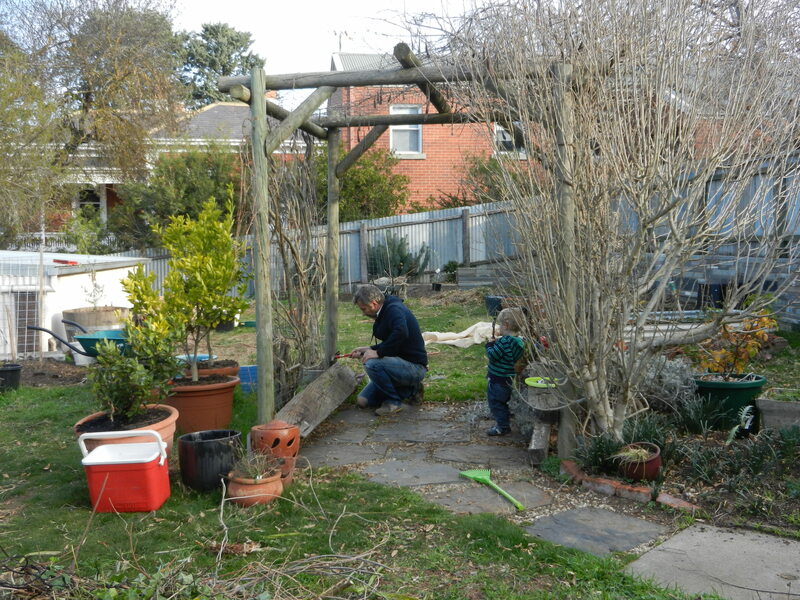 Arbour, vines, tree and paths to be removed. Potato crates waiting to be set up as wicking beds. 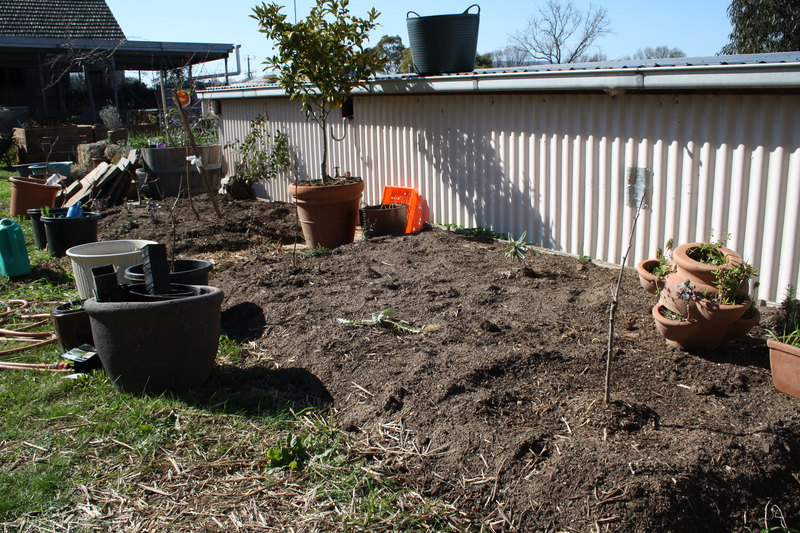 This area gets a bit of shade from the north in winter so the height of the beds should raise the vegies into the sun. 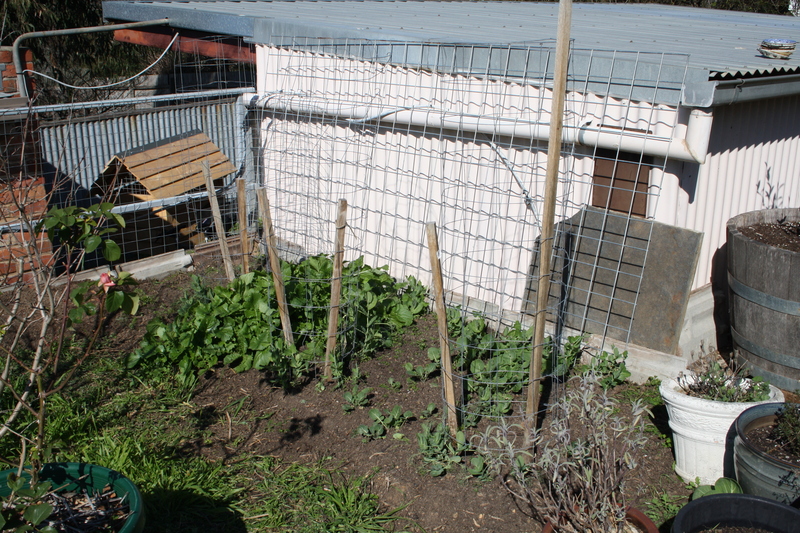 No-dig beds using pea straw as the border, planted with garlic, kale and parsely. Rocket and parsley growing in bed in front of spot for apple espaliers. 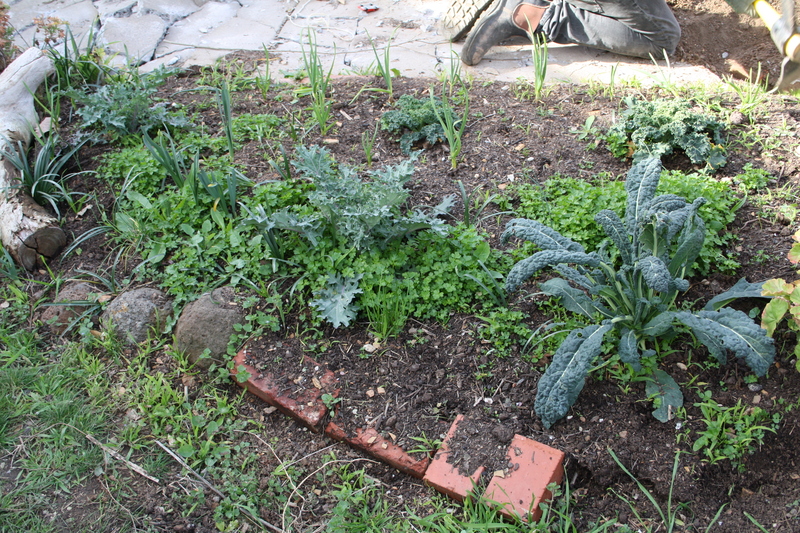 Kale, garlic, and self seeded parsley. 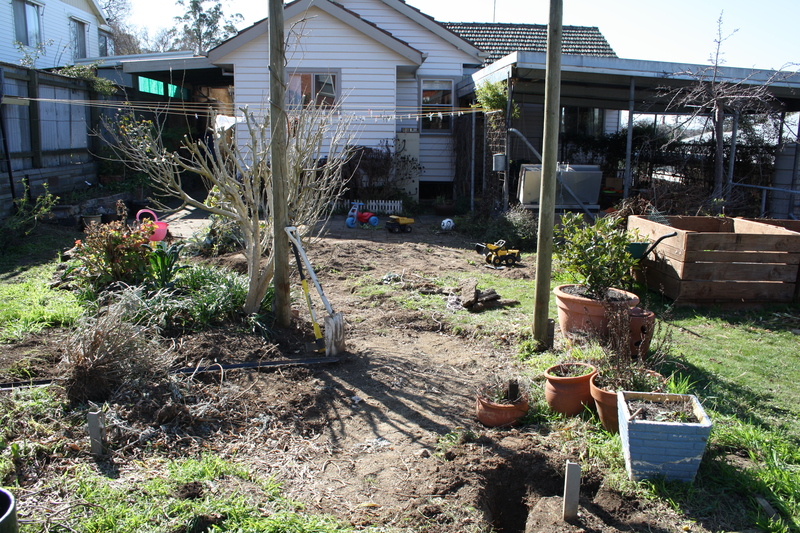 Immediate tasks now are planting of seven stepover apples when they arrive, building up a large new no-dig garden bed area where the arbour and paths were, and planting out spring and summer vegies.